It goes without saying that everyone here at CDL loves the Celeb World and the people within it that make it so incredibly wonderful, chaotic, and ridiculous. So many celebs are on Twitter (and other social media platforms) nowadays that we thought it would be good to round up some of the best tweets that have been released over the past couple of days. Whatya say to that? Check out what some of your fave celebs have been saying lately! And don’t forget to come back next week for the continuation of this weekly installment! Christina Aguilera continues to push her fashions on people: “Get the look – #TheVoice show last night…[pic here]” and Justin Bieber wants you to watch the Victoria’s Secret Fashion show “with @brunomars and @rihanna.” You’d think he’d learn to stop associating himself with anything close to the world of Victoria’s Secret — after all, isn’t he trying to fix that situation with SelGo? Yikes! Today, Miley Cyrus said there’s “Nothing like a little Mary Jane in the a.m.” but don’t worry, she’s just talking about her sweet dog (pic above), who apparently goes by the name of Mary Jane. As far as we know, Miley isn’t a druggy *at the moment* — just a person who could use a bit more sleep. She tweeted this earlier: “Hopefully Tuesday is better than Monday. Here’s to a looooong week.” Aw, feel better, gurl! Rob Kardashian was getting some guff about allegedly calling Rita Ora something to the extent of “Rita Whora.” Somehow, the thing started trending on Twitter and people immediately placed the blame on our dear friend Rob. Wouldn’t be surprised if this Mr. Kardashian decided to blast his ex-girlfriend, who allegedly slept with multiple men while in a relationship with Rob. However, I think this is probably just a misunderstanding. Let it go, folks. “I speak truth. I’m a very Real dude and everything I say I mean… But never called anyone specific a whore and said any names. You all did,” he says in a tweet released earlier today. To stay in the Twitter realm of all things Kardashian, Kim Kardashian recently tweeted a picture of herself wearing a whole bunch of gold crap, to which Scott Disick replied, “I got you that right?” Oh, Scott, nobody cares. K thx bye. Find your relevance elsewhere please. Kendall Jenner released this very mysterious tweet: “it’s like your kiss was laced.” Perhaps she’s having some romance trouble? No worries, her sisters should be able to help out with that. Katy Perry is excited that she finally got the chance to meet Amy grant. “OMG finally met Amy Grant, she’s so nice!” she tweeted several hours ago. And gold-medal Olympian Ryan Lochte tweeted a picture of himself hanging out with Mark Cuban. A couple days ago, Lochte also expressed his desire to find The One: “One of my good friends just got engaged. Congrats! When am I gonna find the one?!?! #InTime” Poor dude. People are already starting to forget about him. Have you stumbled across any other good Tweets? If so, let us know in the comments section below. 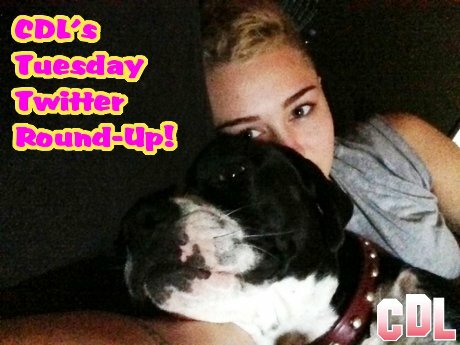 And don’t forget to stop by next Tuesday for another Twitter Round-Up! Kim Kardashian Was Right – Rita Ora Cheated on Rob Kardashian With 20 Men! !